Background Emergency department (ED) visits after hospital discharge may reflect failure of transition of care to the outpatient setting. Reduction of postdischarge ED utilization represents an opportunity for quality improvement and cost reduction. The Community Need Index (CNI) is a Zip code-based score that accounts for a community’s unmet needs with respect to healthcare and is publicly accessible via the internet. The purpose of this study was to determine if patient CNI score is associated with postdischarge ED utilization among hospitalized trauma patients. Methods Level 1 trauma patient admitted between January 2014 and June 2016 were stratified by 30-day postdischarge ED utilization (yes/no). CNI is a nationwide Zip code-based score (1.0–5.0) and was determined per patient from the CNI website. Higher scores indicate greater barriers to healthcare per aggregate socioeconomic factors. Patients with 30-day postdischarge ED visits were compared with those without, evaluating for differences in CNI score and clinical and demographic characteristics. Results 309 of 3245 patients (9.5%) used the ED. The ED utilization group was older (38.3±15.7 vs. 36.3±16.4 years, p=0.034), more injured (Injury Severity Score 10.4±8.7 vs. 7.7±8.0, p<0.001), and more likely to have had in-hospital complications (17.5% vs. 5.4%, p<0.001). Adjusted for patient age, injury severity, gender, race/ethnicity, penetrating versus blunt injury, alcohol above the legal limit, illicit drug use, the presence of one or more complications and comorbidities, hospital length of stay, and insurance category, CNI score ≥4 was associated with increased utilization (OR 2.0 [95% CI 1.4 to 2.9, p<0.001]). Discussion CNI is an easily accessible score that independently predicts postdischarge ED utilization in trauma patients. Patients with CNI score ≥4 are at significantly increased risk. Targeted intervention concerning discharge planning for these patients represents an opportunity to decrease postdischarge ED utilization. Level of evidence III, Prognostic and Epidemiological. This was a retrospective, cross-sectional analysis of ED utilization after hospital discharge from the trauma service at Saint Joseph’s Hospital and Medical Center, an American College of Surgeons-verified level 1 trauma center in central Phoenix, Maricopa County, Arizona. The hospital’s trauma registry was queried to identify the patient study base. Patients admitted to the trauma service between January 2014 and June 2016 and discharged home were identified in the registry. Patients who resided outside of Maricopa County (as per the primary residence address recorded in the registry) were excluded from analyses. Each patient’s Zip code was entered into the CNI database (cni.chw-interactive.org) to obtain the CNI score for the patient’s residence. For example, a patient residing within Maricopa County Zip code 85013 (that of the hospital) would be assigned a CNI score of 3.8 per the CNI database. The outcome of interest was ED utilization postdischarge as related to the index trauma hospitalization. Specifically, each patient’s medical record was assessed to identify ED visit within 30 days of discharge from the initial hospital stay for injury. The reason for ED visit was evaluated, and the visit was not counted if it was deemed to be unrelated to the patient’s injuries evaluated and treated during the index hospitalization. The incidence of ED utilization related to initial hospitalization was evaluated with respect to the CNI score. Descriptive statistics were reported for the overall cohort and for patients who used versus did not use the ED postdischarge. CNI was dichotomized using a distribution-based approach at the threshold of 4. Complications and comorbidities (associated with the index hospitalization, not the ED utilization if any) were dichotomized into respective variables to reflect the presence or absence of any recorded complication or comorbidity. Hospital length of stay was natural log-transformed to account for skew and kurtosis. Demographics and injury characteristics were compared between the utilization and non-utilization groups using independent samples t-tests or χ2 tests. Cohen’s d and ORs with 95% CIs were reported as measures of effect size as appropriate. Adjusted standardized residuals greater than 2 were considered significant cells for contingency tables larger than 2×2. A series of logistic regression models were used to evaluate the association between CNI score and ED utilization within 30 days of discharge. Models were adjusted for patient age, injury severity, gender, race/ethnicity, penetrating versus blunt injury, alcohol above the legal limit, illicit drug use, the presence of one or more complications and comorbidities, hospital length of stay, and insurance category. Predicted probabilities from logistic regression were then used in the receiver operating curve (ROC) analyses. Regression models by insurance group included the same list of covariates with the exception of insurance status. SPSS V.22 was used for statistical analyses. P values less than 0.05 were considered statistically significant. Our cohort consisted of 3245 cases with an average age of 36.5±16.3 years, Injury Severity Score of 8.0±8.1, and hospital length of stay of 3.7±5.7 days (table 1). The majority of patients were male (65.3%), with government insurance, including Medicare and Medicaid (56.1%), and residing in a Zip code with a CNI range of 4.0 to 4.9 (67%). Two hundred and seven (6.4%) patients were identified as homeless through patient report (hospital address listed as home address) and/or comparing patient addresses with a list of nearby shelter addresses. The CNI score for this group ranged from 4.2 to 5. The ED utilization rate was more than double for homeless patients (18.4% vs. 8.9%, OR 2.3 [1.6–3.3]). Among the 3245 index admissions, we identified 309 patients (9.5%) who visited the ED within 30 days of discharge, of whom 85 (27.5%) were readmitted. A higher proportion of readmitted patients had a CNI score of 4 or greater (85.4% vs. 78.3%, p=0.037). The ED utilization group in comparison with the non-utilization group was significantly older (38.3±15.7 years vs. 36.3±16.4, p=0.034), with higher mean injury severity (10.4±8.7 vs. 7.7±8.0, p<0.001), and longer mean hospital length of stay (6.4±8.1 days vs. 3.4±5.3, p<0.001). As shown in table 1, a higher proportion of the ED utilization group were male (p=0.042) tested positive for illicit drugs (p<0.001), had a penetrating injury versus blunt (p<0.001), and higher proportion of in-hospital complications (p<0.001). The distributions of race/ethnicity and insurance status were significantly different by utilization group (p=0.023 and p=0.002, respectively). 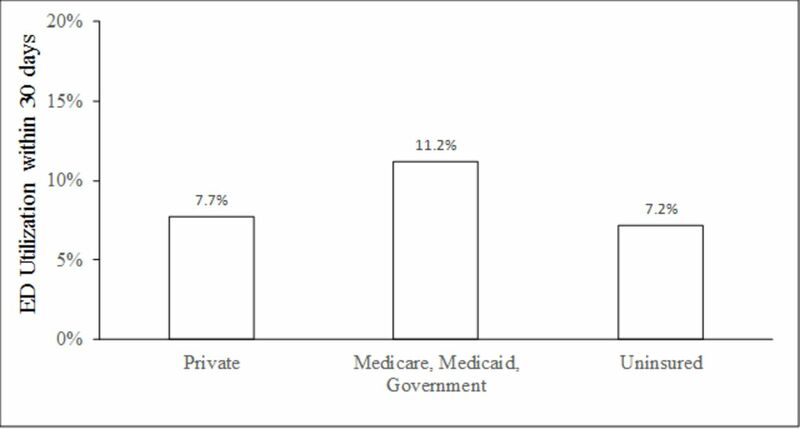 African–American patients and patients with an insurance status of Medicare/Medicaid/other government were over-represented in the ED utilization group (adjusted residual 2.6 and 2.3, respectively), whereas the uninsured group was under-represented (adjusted residual −2.5). There were not significant group differences in ED utilization for the proportion of cases testing above the legal limit for alcohol (p=0.069) or the proportion of cases with comorbidities (p=0.297). The ED utilization rate increased stepwise, with CNI score ranging from 4.7% for CNI score of 1.0 to 1.9, to 14.9% for CNI score of 5 (figure 1). Emergency department (ED) visits within 30 days of hospital discharge stratified by Community Need Index (CNI) score. The 10 most prevalent comorbidities and complications (identified during and associated with initial hospitalization, not ED utilization or readmission) by group are shown in table 2 in descending order by count. The most prevalent comorbidities included smoking (25.5%), drug abuse (12.5%), and hypertension (10.4%), and the most prevalent complications were pneumonia (1.8%), urinary tract infection (0.6%), and deep vein thrombosis (0.5%). With the exception of pregnancy, significant between-group differences in complications and comorbidities reflected inferior health in the ED utilization group. 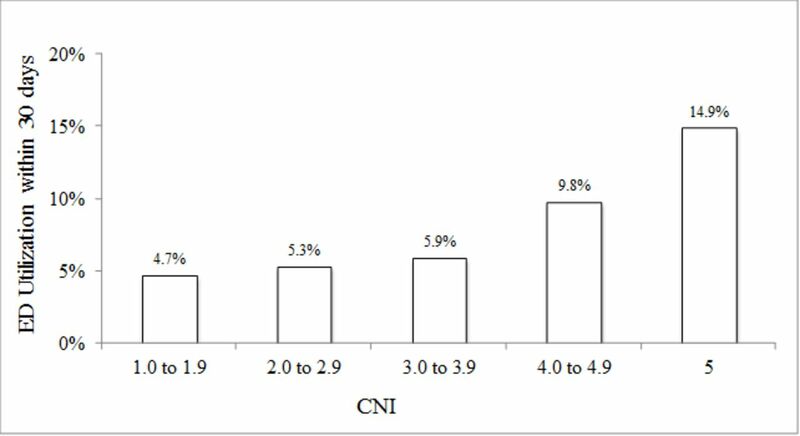 As shown in table 3, in the adjusted logistic regression model with all data, the presence of CNI scores of 4 or greater was associated with ED utilization in comparison with CNI scores of 1 to 3 (OR=2.0, 95% CI 1.4 to 2.9). Differences in the distribution of race/ethnicity and insurance status prompted post-hoc models to understand the association of elevated CNI score and ED utilization. Several small sample sizes within the ED utilization by race/ethnicity subgroups prevented the use of further regression models; however, we were able to further model insurance status. An elevated CNI score (≥4) by insurance status interaction term was added to our model, however failed to emerge as a significant predictor of ED utilization (data not shown). ED utilization according to insurance status is demonstrated in figure 2. When modeled separately by insurance status (table 3), a positive association between elevated CNI score and ED utilization emerged in the private group (p=0.027) and government group (p=0.012), but not within the uninsured group (p=0.208). Emergency department (ED) visits within 30 days of hospital discharge stratified by patient insurance status. Due to the large number of covariates in our model, we were unable to randomly subset our data set into two groups to perform validation testing. Alternatively, post-hoc 2×2 Pearson’s χ2 analyses were used to describe the association between elevated CNI score and ED utilization using a random subset of 80% (n=2587) of cases, followed by the remaining 20% (n=658). Consistent with our regression models, in the combined model with all insurance status categories, elevated CNI score was positively associated with ED utilization in the 80% and 20% subsets (p=0.017 and p=0.003, respectively). We also sought to determine if income alone would have as strong an association as CNI score with postdischarge ED utilization. To test this we calculated quintiles of median Zip code level income based on census.gov 2016 data. We dichotomized this variable by combining the two quartiles reflecting the lowest income into a single category compared with the remaining quintiles. This variable replaced the CNI scores 4+ versus 1 to 3 in our adjusted logistic regression to compare the difference between CNI score versus income alone. The results confirmed CNI score as having a stronger association than income using the p value (p<0.001 vs. p=0.006), OR (2.0 vs. 1.5), and Wald statistic (13.2 vs. 7.5). In this study, we evaluated the performance of the CNI score, an easily obtainable marker of the social determinants of health, with respect to its utility for identifying patients at risk for failure to transition to the outpatient setting as represented by postdischarge ED utilization. Stratification by CNI range demonstrated a stepwise increase in the rate of ED visits within 30 days of hospital discharge associated with increasing CNI score. With adjustment for variables related to patient characteristics and hospital course, CNI score of 4 or more was associated with increased risk of postdischarge ED utilization. The effect sizes reported as Cohen’s d and ORs are small, suggesting the association between CNI score and ED utilization is significant but modest. The ability of our model to discriminate between patients who will versus will not use the ED in all models is also modest as reflected by the area under the curve statistic of less than 0.70. As a result, we propose CNI to be used as a general tool indicative of postdischarge ED utilization risk . CNI is easily accessible for each patient relative to other socioeconomic markers and was observed to have a stronger association with ED utilization than Zip code-based income data as described above. This is the first known examination of CNI utility at the patient level, rather than community (for which it was designed), and our findings suggest that CNI may be a useful patient-level metric to include in discharge planning after hospitalization for trauma. A recent study by Hall et al 9 described the successful implementation of a Trauma Transitional Care Coordination program, which led to a significant decrease in 30-day readmission rates. By identifying patients with specific medically related, injury-related, and social risk factors, it followed a model of well-established programs employed for chronic medical conditions. It follows that individual patient CNI score could be included as a social risk factor for targeting patients most likely to benefit from transitional care coordination resources. Determination of a patient’s CNI score during admission can be done quickly, easily, and at no cost via the publicly accessible CNI website (cni.chw-interactive.org). Based on our results, it would be reasonable to assign all patients with CNI score of 4 or more to whatever specific resources are available at the institutional level for transitional care. At our own institution, we are currently exploring how to best allocate the transitional care resources that are available, including a transitional care clinic and support program for supplying free durable medical equipment, transportation, and logistic support for the transition to home from the hospital. Although prior studies have evaluated readmission after hospital discharge among trauma patients, there has been a relative paucity of reports concerning ED utilization. Ladha et al 5 evaluated ED utilization within 30 days of hospital discharge among trauma patients from a single institution over 10 years. Of 6675 patients, 13.3% returned to the ED within 30 days of discharge from the hospital. They observed that uninsured patients (OR=1.64) and publicly insured patients (OR=1.60) were more likely to visit the ED than those with commercial insurance. The authors also observed that residing in a neighborhood with a median household income less than $20 000 was associated with higher odds of re-presentation (OR=1.77). In a similar single-institution, 6-year retrospective study from a pediatric trauma center, ED utilization postdischarge within 30 days was 3.9% of 1863 patients.6 Patients with public insurance were almost twice as likely to return compared with those with private insurance (OR=1.92); however, no significant association was observed for the uninsured. Income by Zip code was also associated with the risk of a return visit, with patients in neighborhoods at less than the 50th percentile of income being twice as likely to return to the ED (OR=2.15). In the present study, the association with socioeconomic status by Zip code and ED utilization was also evident, as the CNI score reflects neighborhood economics. The relationship between insurance status and ED utilization, however, is not consistent across the two prior studies and the current study. It is likely that this is, in part, a result of differences in uninsured prevalence across the studies. In the study by Ladha et al 5, the uninsured represented the majority of patients (68.5%). In the pediatric study by Ruttan et al 6 and the current study, the uninsured were in the minority (11.1% and 19.0%, respectively). Limitations of the current study include that CNI was developed to index healthcare disparities across communities as represented by Zip code. CNI does not reflect the inherent variability concerning barriers to care within a Zip code, and in particular may not accurately reflect the specific resources available to the individual patient irrespective of their Zip code-based CNI score. Nonetheless, prior studies have demonstrated that socioeconomic status as determined by median income per Zip code is associated with outcome, and it would therefore be expected that CNI, as a marker of socioeconomic status, would behave similarly.5 6 10 An additional limitation is that postdischarge ED utilization was only captured for patients who returned to our trauma center’s ED. It is presumable that a number of patients visited the ED at other hospitals. Despite this limitation, there were still a significant number of patients (309) who presented to the ED at our trauma center after discharge. It is notable that Malhotra et al 11, in a study of close postdischarge follow-up from the trauma service, found that 75% of the patients in their sample who visited the ED after discharge did so at the hospital from which they were discharged.11 Lastly, it was not possible to accurately discern from chart review whether or not each ED visit was potentially avoidable. Although the majority of patients were not readmitted, this does not necessarily imply that the patients discharged home from the ED all could have been managed elsewhere, such as the clinic. It is presumable, however, that a number of these patient visits could have been avoided with better transitional care planning. In this study, we identified that CNI score is associated with postdischarge ED utilization among trauma patients. Specifically, patients with CNI score ≥4 have approximately twice the odds of a postdischarge ED visit in comparison with CNI score <4. The CNI incorporates five domains that may affect access to healthcare within a community: income, culture/language, education, housing status, and insurance coverage. An individual patient’s CNI score is easily accessible; the CNI score for every Zip code is freely available via the internet. Although the CNI was intended for application at the community level, rather than at the individual level, it appears to have applicability to individual patient care. Whether or not targeted individual attention according to patient CNI score will translate to a more successful transition to the outpatient setting remains to be determined.
. Conditions With the Largest Number of Adult Hospital Readmissions by Payer, 2011. HCUP Statistical Brief #172. 2014. http://www.hcup-us.ahrq.gov/reports/statbriefs/sb172-Conditions-Readmissions-Payer.pdf.
. Hospital readmissions as a measure of quality of health care: advantages and limitations. Arch Intern Med 2000;160:1074–81.
. The community need index. A new tool pinpoints health care disparities in communities throughout the nation. Health Prog 2005;86:32–8. Presented at Presented at the 70th Annual Meeting of the Southwestern Surgical Congress, April 8–11, 2018 in Napa, California. Contributors D-DH, KMC, PWG, JAW, SRP contributed to concept, design, analysis, article preparation, and critical revisions. D-DH, NSR, JLD contributed to data collection. SI, MZS contributed to analysis, article preparation, and critical revision. Ethics approval This study was approved by our institution’s IRB.